NEW Bob Martin Flea Clear contains Fipronil, the same active ingredient as Frontline. 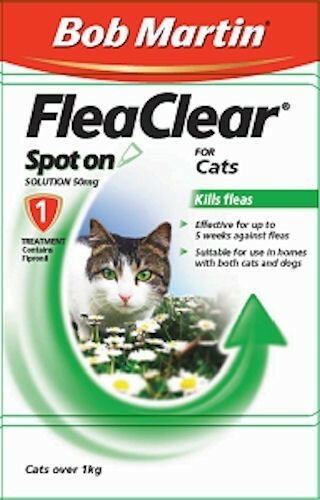 Bob Martin Flea Clear is a spot on treatment to kill fleas on cats over the weight 1kg. Bob Martin Flea Clear 1 pipette is effective for up to 5 weeks for cats. Bob Martin Flea Clear is safe to use in households which have both dogs and cats.